Welcome. My name is Megan Williams and I am a registered Psychologist. I began counselling people after I completed my Graduate Diploma in Applied Psychology in 1994. Then in 2003 I completed a Masters in Counselling Psychology at La Trobe University and became a fully registered Psychologist. My counselling experience has been broad-ranging including working in the community health sector, counselling students and staff at two universities in Melbourne, working in specialist agencies including helping people affected by road trauma, HIV/AIDS, as well as providing group learning and training both as a counsellor and as a tutor and workshop leader in the tertiary education sector. I am passionate about social justice, especially the right for all people to receive professional and compassionate counselling for psychological concerns whatever their financial circumstances, and I currently work in the Not-For-Profit sector. I have had the privilege of helping people through some very difficult times in their lives and have worked with people who struggled with anxiety, stress, grief, depression, trauma, and many other concerns that life can throw at us. Through my professional experience I came to the realization that we all need some easy to use strategies to create moments of calm in a storm of emotions, thoughts and memories. 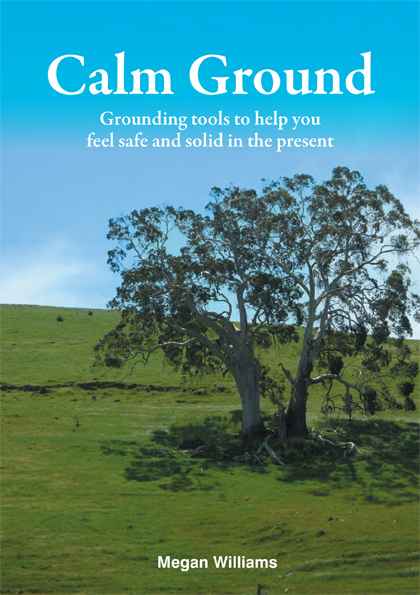 I have been teaching clients Grounding skills for several years but I could not find a book that was dedicated purely to giving people these skills in an accessible way. When you or I are stressed, when people are suffering from the effects of trauma, or they have an anxiety condition, reading a lot of theory and filling in a lot of worksheets may be too overwhelming at first. I have taken a step back from that approach to provide a book that is calming not only through providing simple to follow tools but also in its design and illustrations including photos of attractive landscapes. I know the techniques in Calm Ground work because I have been teaching them to clients for years and they tell me they are helpful in managing their distress. I also use Grounding myself when I feel my stress level rising and I find breathing deeply, listening to music and focusing on nature particularly helpful to me. I am pleased that writing this book creates the opportunity for me to share these tools with many more people than I can see in person.